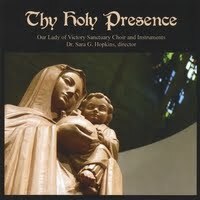 Some of you have heard Sanctuary Choir's CD, "Thy Holy Presence," by now, and you know how good it is! The CD is full of wonderful music. The Lyon Family String Ensemble accompanies us on Mozart's wonderful Ave Verum Corpus, and we sing several other favorites, including John Stainer's God So Loved the World, from his oratorio The Crucifixion. Olivia Leskowicz is our featured soloist on Jeffery Honoré's moving Gethsemane Prayer, using the words of the Lord's Prayer to express Jesus' struggle in Gethsemane. You will be hearing us sing many of these pieces this spring, so why not buy a CD so you can take them home with you? And we will remember you when we sing some of these selections in Rome! The cost is only $20 for 19 songs. If you already have a CD, consider giving some to friends who may need renewal in their walk with God, or to people you know who can't get out to church very often, or to people who just like to hear good choral music, or to people who don't believe a church choir can sound good! Of course it will also come in handy next Christmas since it has music for all seasons! Checks should be made payable to OLV Music Ministry, memo "Rome choir."